PTF.Tweet is a Custom Notification that can send automated tweets about your network status. PTF.Tweet is registered at Twitter and is allowed to send notifications to your Twitter account without user interaction. First you have to run PTF.Tweet manually from the '\Notifications\EXE' folder of your PRTG Server using the -r parameter. 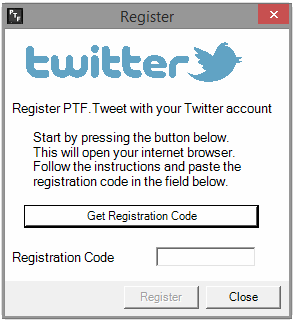 This will popup the registration window where you can register PTF.Tweet with your Twitter account. After successful registration, PTF.Tweet is added as an application to your Twitter account. -a= The Twitter account name. -t= The Tweet to post. -d Switch to post a direct message instead of posting a tweet. -d= Optional the Twitter account to send the direct message to. Note: this account must be following you in order to send a direct message. -r Switch to register an account. See also Paesslers blog post "PRTG Alerts via Twitter"